The OpenPGP standard (rfc 4880) defines a way to embed images within OpenPGP public keys. This was designed so that the OpenPGP key file can also be used to remind us visually who’s its owner. Unfortunately, the only supported by the OpenPGP standard file format for images is JPEG. In this chapter we are going to demonstrate how to work with image files in association with OpenPGP keys. 1. Add an image file to an OpenPGP key. In order to add an image file to an OpenPGP key, we have to import the key into a KeyStore object. It must be noted that we must also have the private key component of the public key that we wish to associate the image with. Dim imageLocation As String = "c:\Pictures\Me.jpg"
In the example below we load the first image contained in an OpenPGP key (if exists) into a System.Drawing.Image object. 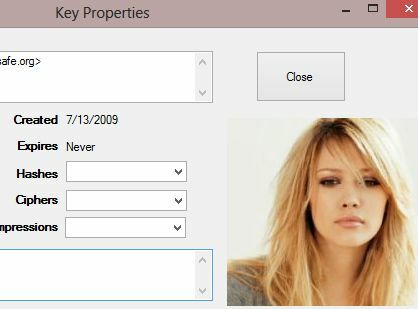 KeyToolsCS(VB) – demonstrates how to add a JPEG photo in an OpenPGP key and how to see it.